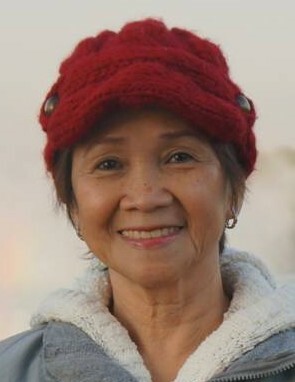 Chita Somera, 72 of Waukegan, passed away on Thursday, April 11, 2019 at Vista East Medical Center in Waukegan. She was born on February 28, 1947 to Jose Somera Sr. and Isabel Daepo in the Philippines. She enjoyed cross stitching, cooking, working and shopping. Her favorite time was to be spent with family, especially her grandchildren and watching Filipino channel soap operas. Chita is survived by her sons, Vernell (Grace) Ednilao, Varidell (Wendy) Ednilao, and Guilbert (Samantha) Somera, her first husband, Virgilio Ednilao, her grandchildren, Vernice Ednilao, Vea Ednilao, Vincent Ednilao, Veronica Ednilao, Victoria Ednilao, Vanessa Ednilao, Jardell Ednilao and Vergeal (Maralee) Ednilao, her great grandchildren, Leigha Ednilao and Lorenzo Ednilao. She was preceded by her parents and her husbands, Simeon Santos and James Richard Parham. Visitation will be from 4:00 to 8:00 p.m. on Sunday, April 14, 2019 and again from 10:00 to 11:00 a.m. on Monday, April 15, 2019 at Warren Funeral Home located at 1475 N. Cemetery Rd. Gurnee, IL. Funeral services will be at 11:00 a.m. on Monday, April 15, 2019 at the funeral home. Father Dennis Zalecky will officiate. Warren Funeral Home is assisting the family.